A clear understanding of IT environment resources utilization is vital to estimate whether the system can cope effectively with the current or enlarged loads. 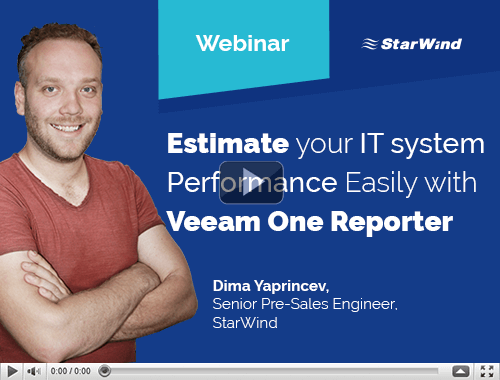 This webinar demonstrates the functionality of Veeam One Reporter, a handy tool for comprehensive assessment of infrastructure performance and system’s health. Veeam One Reporter presents information on system’s performance in a set of convenient and dedicated tabs. For example, the Summary tab informs about the system health, including such parameters as the state of hosts, datastores, and virtual machines. The tab also contains information about warnings and errors. Users can study them just by clicking the appropriate area in a health diagram. Additionally, the window provides information about the problem, its causes, and solution. To say more, every VM can have its properties examined in the VMs tab. The tab contains the list of running VMs, their properties, and consumed resources. Clicking a particular VM gives an insight into its RAM, CPU, and Guest Disk Space utilization. Eventually, Veeam One Reporter is a useful tool for monitoring infrastructure IO, throughput, and extent of capacity and memory use. This information can be acquired in the Overall tab and other generic tabs (i.e., CPU, Memory, Network, and Datastore tabs). What is more, users can study a particular resource’s utilization changes over the specific period or schedule reports arrival.